Breakfast isn’t a typical cafeteria meal for me, because I prefer to make my own fruit-filled oatmeal or smoothie in my room. But this morning I met a friend for breakfast in our all-you-can-eat style cafeteria. It was a little challenging finding healthy and filling options amid the donuts, biscuits and gravy, french toast and waffle maker. I just gotta laugh when I see fellow students piling their plates high with tater tots, sausage links, bacon, pancakes, chocolate chip muffins AND a bagel….you didn’t eat like that at home, so why would you here?! If you want to avoid the freshman/sophomore/junior 15 you have got to drop the “I have to get my money’s worth” attitude! Or else you’re “money’s worth” meal will cost you a new pair of pants in a couple months….. Fear not – I created a balanced breakfast with a sweet parfait! A fruit n’ yogurt bowl is an easy healthy go-to breakfast. Options were limited to canned peach slices and pineapple, and I would’ve preferred to add a banana but in the cafeteria setting it’s all about working with what you’ve got! I topped the fruit with a little Raisin Bran. 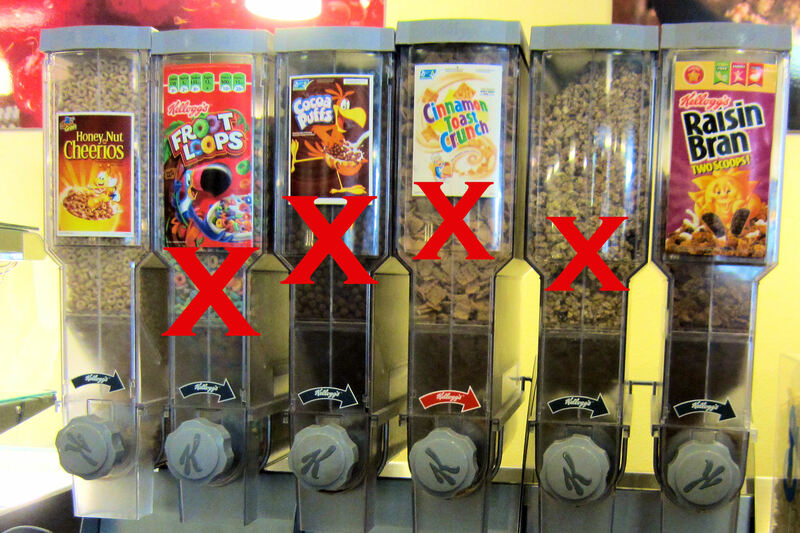 I know Raisin Bran still has a considerable amount of sugar but look at my options! Breakfast with a side of diabetes? Taking out the Froot Loops, Coco Puffs, Cinnamon Toast Crunch and Kellogs Granola leaves good ole’ Raisin Bran looking pretty good! 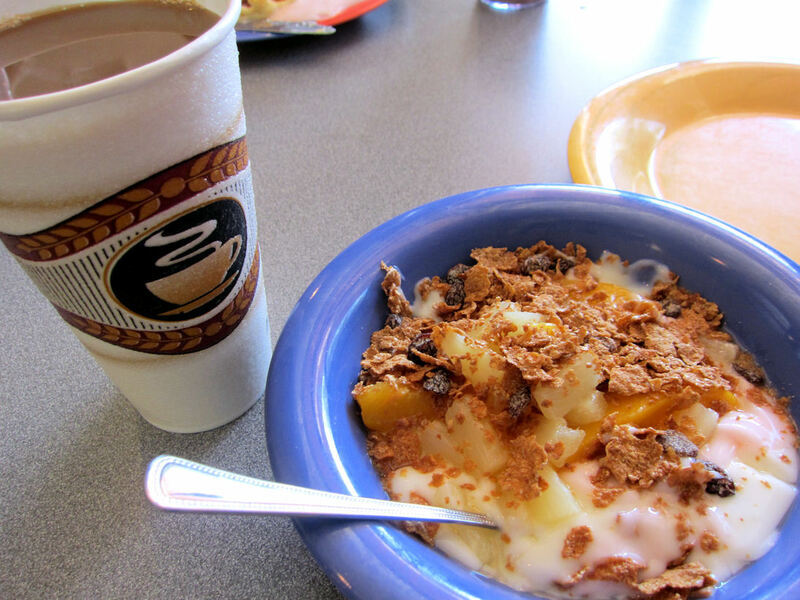 And of course I have to commend the cafeteria on their surprisingly delicious coffee. To round out the meal, I small serving of eggs with diced peppers and some salsa left me full through the morning and into my “Stretch & Relaxation” class! The pancakes and muffins may look appetizing for an instant but I always feel heavy and full after such a bread-y breakfast. This light and fruity bowl was the perfect start to the beautiful day and kept me sitting tall in a summer sundress through out class! 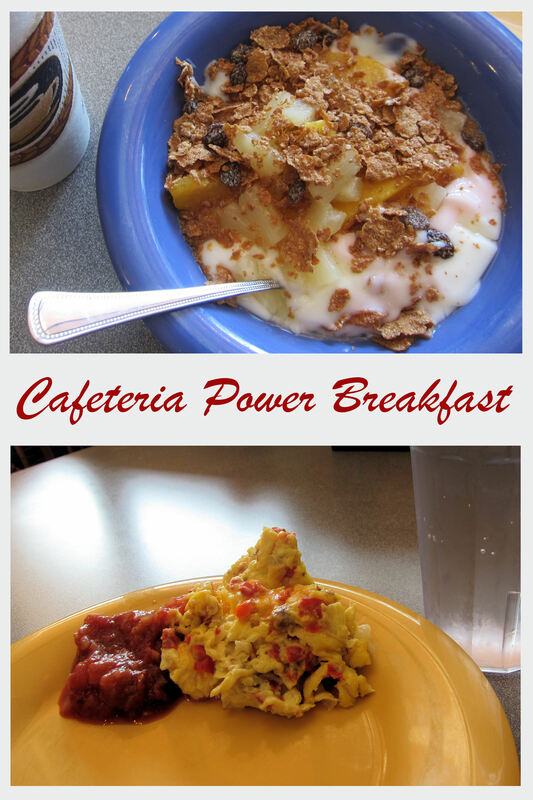 Posted on August 30, 2012, in Breakfast, College, Dining Out and tagged breakfast, cafeteria, college, Dorm, fitness, healthy eating, healthy living, Inspiration, Motivation. Bookmark the permalink. 4 Comments. They have some nice choices at college campuses.. I thought it was just greasy and had no nutrients. I actually found this really interesting and I’m surprised they didn’t have healthier options to choose from! Where I spent my freshman year at college in the dorms they actually had some decent options. Of course there was the waffle bar, etc., but there was also always scrambled eggs, hard boiled eggs (my favorite), oatmeal (which is the best oatmeal I’ve ever had in my life) and fresh fruit. I feel lucky that I was able to eat that well as a college freshman!